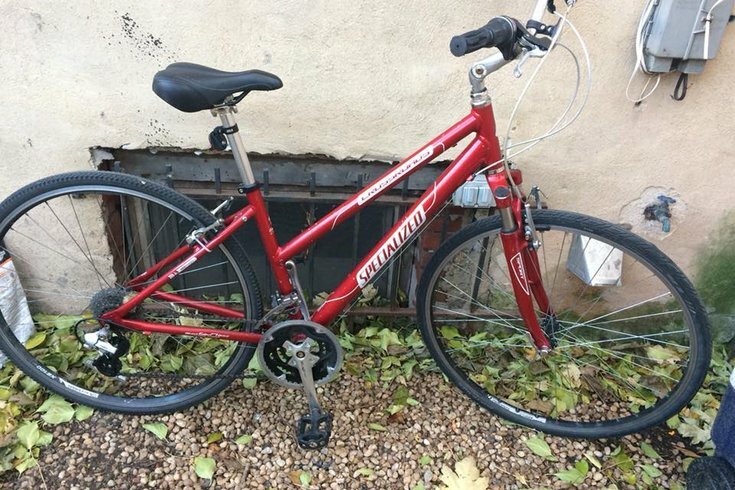 A Southwest Philadelphia man bought this likely stolen bicycle outside a Center City liquor store. A quest to find the owner has blossomed on social media. What would you do if you saw someone selling a decent bicycle outside a local liquor store for a mere $10? Would you walk on by, ignoring the offer? Politely decline? Call the police? Tap into the Black Friday spirit and take advantage of bargain basement prices? Or would you do what Derek “Danger” Moorer and his girlfriend Rose Robinson did in Philadelphia over the holiday weekend? It all happened around 4 p.m. Sunday outside the liquor store near 15th and Locust streets in Center City. Moorer was there to pick up a bottle of wine. "It was clearly a stolen bike and my concern was that if I didn't buy it someone else would and who knows what would've happened. Nobody likes having their bike stolen. My bike is my car." Instead of calling the police, they went the social media crime-solving route when Moorer brought it to their home in the Graduate Hospital neighborhood. “I initially was not on board with him buying a potentially stolen bike. We have both had bikes stolen before so we know the feeling,” explained Robinson. “He explained that he bought it so that he could use social media to hopefully get it back to its rightful owner. Moorer used a different question in case they couldn't find the owner: "Do you know where I can donate it to a good cause?" "I think our chances are pretty good. Fifty-six people shared (Rose's) post and a bunch shared mine," Moorer said. "If it goes too long, hopefully we'll be able to find a good place to donate it, one that helps underprivileged children who need bikes." Their mission of kindness has not returned the stolen bicycle as of Tuesday morning. On Monday, a mother contacted Robinson thinking the bicycle might be her son’s. A bicycle serial-number comparison proved it wasn’t, though. “We were both disappointed,” said Robinson. Do you recognize the bicycle pictured above? Well, drop us an email (subject line: Stolen Bicycle) and we’ll forward it to Robinson and Moorer.